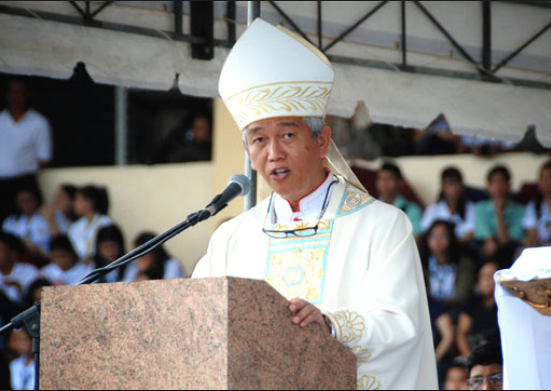 In his blog, leading prelate Manila Auxiliary Bishop Broderick Pabillo has encouraged the Church followers to wake up and stand up against evil days after President Rodrigo Duterte’s remarks about ‘stupid god’. The prelate also questioned the sincerity and “openness to truth” of the government’s four-man committee assigned to dialogue with the Catholic Church leaders. “I am happy that many people are now speaking out. Duterte crossed the red line when he insults our God. People have come out of their stupor. I say to all, wake up and stand up. Evil should not be tolerated,” Pabillo said. “who has no respect for others and even for God is himself not respectable.” He also said. Pabillo lamented that people’s right to choose their own belief does not give a person the privilege to attack and publicly shame others, not even the highest official of the country. “Some continue to tolerate Duterte on the ground of freedom of speech and even of freedom of religion. Freedom of speech should not be given as a reason for such a blasphemous attack. Freedom of speech brings out with it responsibility to respect what others hold dear. If Duterte does not believe in the teachings of our faith, we cannot do anything about that. He can believe what he wants,” he said. On Saturday, June 30, Presidential Spokesperson Harry Roque announced that President Duterte will have a one-on-one dialogue with Catholic Bishops’ Conference of the Philippines (CBCP) President Romulo Valles. Roque said that four-man membered panel is tasked to dialogue with CBCP. This announcement was made a day after the meeting with Papal Nuncio Gabriel Giordano Caccia in his Malate residence on Friday night. “In my meeting with the Papal Nuncio yesterday night, it was agreed that both State and Church should work together for the benefit of the people,” Roque said in a statement. “It was also agreed that President Rodrigo Roa Duterte will have (a) one-on-one dialogue with the President of the Catholic Bishops’ Conference of the Philippines,” he said. Meanwhile, Pabillo questioned the Duterte administration’s sincerity in the reconciling difference with other religious groups not only with the Catholic Church because of its debatable historical records when it comes to “openness to the truth”. “Unfortunately the track record of this government does not point to this. First, the persons that are asked to conduct this dialogue on their part do not have a good record of openness to the truth,” Pabillo said, referring to the dialogue panel members. The panel members are; Palace spokesman Harry Roque Jr., political strategist Pastor “Boy Saycon,” Foreign Affairs Undersecretary Ernesto Abella, and Secretary to the Cabinet Leoncio Evasco, a former priest. “Do Roque, Saycon and Panelo have the ability to understand their dialogue partners and not jump to conclusions and false accusations as they are doing now?” the prelate said. Pabillo added that dialogue should have happened even before the president criticized the Church.